>Cubic Zirconia, loose, round diamond cut stones. Cubic Zirconia (CZ) is the cubic crystalline form of zirconium dioxide (ZrO2). The synthesized material is hard, optically flawless and usually colorless. 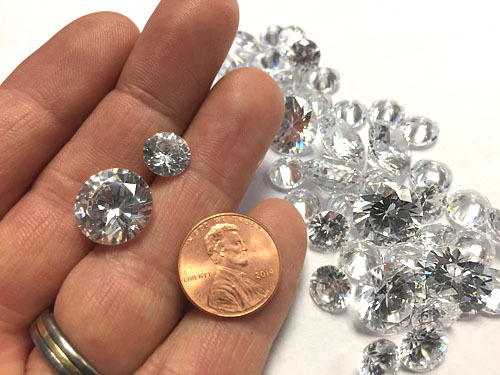 Because of its low cost, durability, and close visual likeness to diamond, synthetic cubic zirconia has remained the most gemologically and economically important competitor for diamonds since commercial production began in 1976. Our larger 13.5mm size is sold out, however we have a good stock of the 9 mm samples. These are brilliant, high quality CZ.